An interdisciplinary research project addressing the development of commercial biorefinery in Sweden has been carried out between June 2015 and May 2018 by the Luleå University of Technology (LTU), the International Institute for Applied Systems Analysis (IIASA) and RISE Research Institute of Sweden. 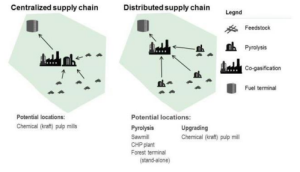 Starting from a 2050 scenario being related to the Swedish context, such study aims at generating new knowledge and a model framework for advanced system analysis in the field of new value chains, products and efficient biomass feedstock utilisation. While decentralised supply chains configurations are favourable at very high biofuel production levels or under very high biomass competition, centralised supply chains are preferable under lower biomass competition conditions. Differences between decentralised and centralised supply chains, pag. 23 of the above-mentioned study. The whole study underlines the significant role of industry as well as that of policy makers, technological providers and research institutes: as biofuel production costs still exceed the price of fossil transport fuels after implementation of the investigated cost reduction strategies in Sweden, policy support and stimulation of further technological development is essential to achieve cost parity with fossil resources. This post is based on Large-scale implementation of biorefineries: New value chains, products and efficient biomass feedstock utilisation by Lundmark R., Forsell N., Leduc S., Lundgren J., Ouraich I., Pettersson K. and Wetterlund E.